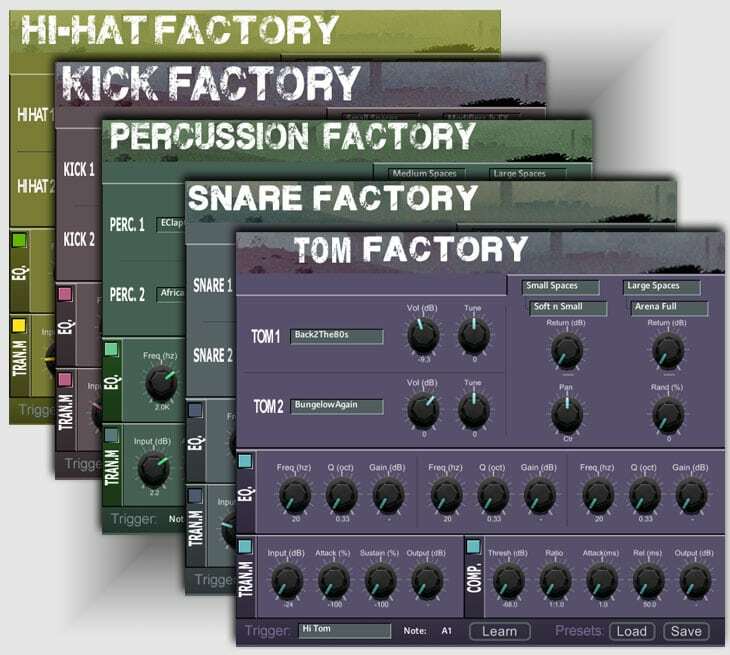 In a world with a million drum samples, most of them from an 808, finding the perfect personalised instrument sound, one that fits your track and is unique to you is still just about impossible, until now….enter the Factory instruments. Designed to offer you an almost unlimited palette of sounds that are tweakable in intuitive and creative ways. Each Factory gives you the power to make your drum sounds your own, and no one elses. All the Factories work in the same way, so get the hang of one of them and you have them all. Select any two of the included multi-sampled drums, mix their levels, retune them, even radical amounts downwards for that real sub-sub, or upwards to make your kick into snares or hats (or the other way round, your call). Next add EQ, and transient shaping, then a compressor. Finally add up to two room, or special effects convolution processors, the possibilities are nearly endless. All contained in a single user-friendly interface in Kontakt 5+. You’ll nail that one-off sound for sure….